Property giant Lendlease has secured co-working hub operator Spaces in two of the office towers at its $2.5 billion Melbourne Quarter development in Docklands, says the AFR. The hub operator, part of International Workplace Group, which was previously known as Regus, will take 7,000 square metres in total, in one of the largest single deals in the rapidly growing co-working sector. 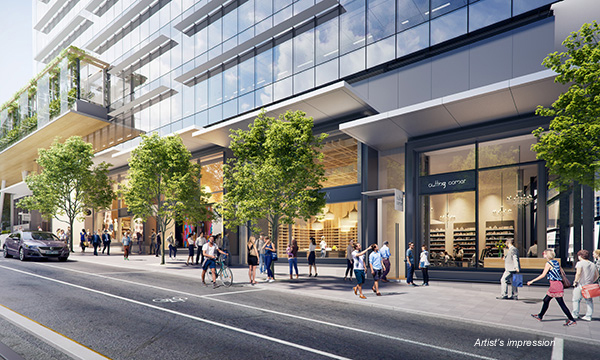 Spaces will occupy one floor at One Melbourne Quarter and more than 4,000 square metres over two floors at Two Melbourne Quarter with more than 700 flexible workstations available when completed in mid-2020. Commercial office space in the Melbourne Quarter towers is being leased at around $560 on a net face basis, according to industry sources. One Melbourne Quarter and Two Melbourne Quarter are located within the Batmans Hill precinct of Docklands. Spaces will also run the business lounge facilities in each building’s lobby as extensions of their workplace. The move marks the fourth Spaces co-working centre in Victoria, with other hubs being located in Richmond as well as the Rialto Towers and the refurbished T&G Building at 161 Collins Street. A recent report by parent company Regus forecast about 12 per cent of all commercial office stock in Australia will be used for flexible workspaces by 2030. The projected boom of the flexible workspace industry over that period is forecast to increase Australia’s economic output by $122 billion. Citing the CBRE Pacific Corporate Co-Working Survey 2018, the AFR recently reported up to three-quarters of all tenants occupying 30,000 square metres or more across their portfolio said they intended to cut their traditional leased office footprint, and all planned to increase their use of co-working space. In line with the figures reported by rival agency Knight Frank last year, CBRE says the flexible workspace industry occupies about 193,200 square metres of space across the six major capital cities in Australia, with 40 per cent of occupiers utilising some form of flexible workspace solution. “This year, the growth of flexible working is predicted to rise across Australia, as more office-based activity is demanding greater choice and flexibility in the workplace, for businesses, organisations and their employees,” said Damien Sheehan, IWG’s head in Australia.